2014 nothing happened… Finally I am back, I have been occupied for a while. I decided to move the website away from wordpress as I was geting sick of the constant updates and moved to somthing a little bit more geeky. I am now using Jekyll a script that generates the website offline using markdown as the templating system. I hope to make the website a little cleaner and more about content. 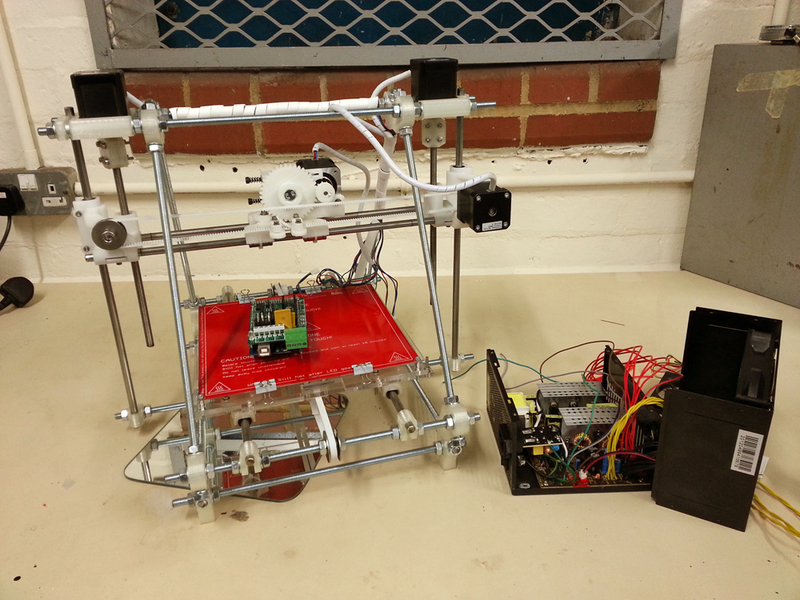 Thigs have advanced a lot since I last updated, I now have a fully working 3d printer (Prusa i2) and a CNC router (shapeoko 2) both aready not the latest model! This means I have much more capability to produce one off objects ( read synthesizer panels! ). 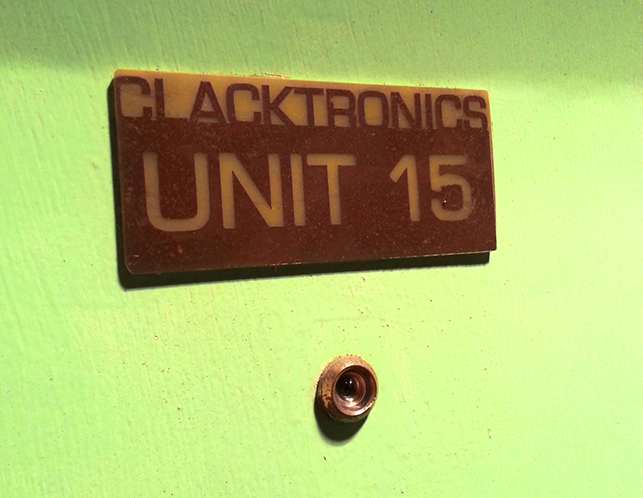 Clacktronics is still homeless but by the end of the year (2015) I hope to have a fully functional shed workshop! After 3 years in Tottenham Hale, I have now moved across the reservoirs to Walthamstow where I can now build a proper Workshop in a shed! Here is my old door sign that I made from PCB material. I found this at work, at first it looked like some kind of intercom but then I realised it is called a “Cri Call”. It is an old valve based baby monitor! What you do is screw the small box onto the wall in the babys room then trail a wire along your hallway to your living room to monitor the baby. Next test, put a guitar into it! it will definitely make a neat (tube!) practice amp. Yes, I have also been swept up in the hype, after a few years of looking at them and wishing I could afford to make one I took the plunge as I worked out it could easily be done for around £350. It is mainly made from kit parts as it was almost the same price as sourcing the parts myself. I have some ideas for miniature leslie speakers and other such electro-mechanical gimmicks. watch this space! I had this one sitting on my desk a while. Whilst at the Music Hackspace in London another member (Bioni Samp) showed me this to look at. At first I thought it must just be another BBD or specialist IC delay but upon looking inside I realised it was a discrete 8 bit digital delay using an 8k x 8 sram IC as its memory. It was broken and I didnt really have enough time to fix it but because it was so interesting I took it. I quite often get approached by artists and designers to produce electronic parts for them. Recently I seem to have made a lot of LED projects! 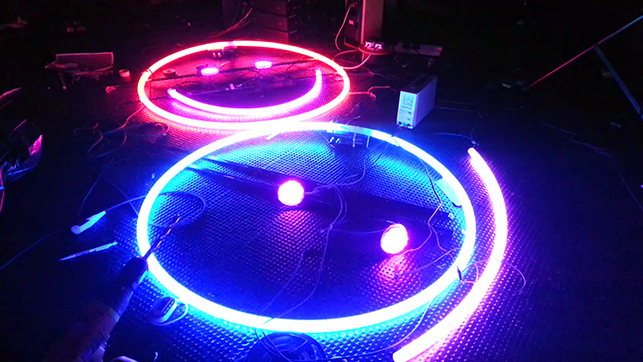 Above is part of a series of LED hoops that were commissioned for the band Django Django. This was by the artist Kim Coleman who needed them as a part of her stage design for the band.